Slice the bases from the Brussels sprouts and carefully separate the leaves, pulling them off the sprouts. Fry the bacon in a frying pan over a medium heat until soft butnot coloured. Remove from the pan and drain on kitchen paper. Set aside. Melt the butter with the bacon fat in the frying pan over a medium low heat. When the butter is foaming, add the Brussels leaves and stir in the bacon. Add 2 tbsp water and cover the pan. Allow to cook for 3–5 minutes and season with salt and pepper. 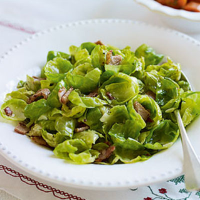 The Brussels sprouts can be shredded with a knife if time is short. This recipe was first published in Wed Dec 01 00:00:00 GMT 2010.